Pulpit and organ at First Presbyterian Church (Tulsa, Okla.), June 2017. I had come packing video from PHS's collections. First, of the 1928 General Assembly in Tulsa, which featured footage of First Tulsa's since-destroyed Greek Revival building, and of the Art Deco Boston Avenue United Methodist Church, then under construction. Second, footage from the 1964 General Assembly meeting in Oklahoma City, which included Edler G. Hawkins speaking at Westminster. I had tried to shore up what little I knew of Oklahoma Presbyterian history, largely by reading Cassity and Goble's Divided Hearts, a comprehensive account beginning with the earliest mission work among the Cherokee and Choctaw peoples. It was close to 9 PM in Oklahoma City by the time I settled in to the hotel on June 1, given the first of a succession of impressive sunsets. Not bad, you guys. Oklahoma City, OK, June 2017. I was up at 5 AM to get ready for the 90-minute-or-so drive to Enid, which is a straight shot north with one left turn, through oddly familiar grazing land dotted with stands of trees, like my own Shenandoah Valley, only with its kinks and hollows flattened. First Presbyterian Church, Enid, site of the meeting of Oklahoma's three presbyteries, was organized in 1894. Their current building, replete with stained glass, memorial displays, and the church's first pulpit, dates to 1925. PHS Board member Ernie Higginbotham helped out at our exhibit space, where we spoke with folks from Miami, Oklahoma (not pronounced how I thought), from the University of the Ozarks, and from Trinity Presbyterian Church, Oklahoma City, the first integrated Presbyterian congregation in Oklahoma. The presbytery meetings wrapped up midday of June 3, and I drove in caravan with folks from Indian Nations Presbytery, with the ultimate aim of doing some records appraisal at the presbytery offices, but with one important timeout: fried chicken and fried okra at Eischen's in Okarche. After lunch, we arrived at First Presbyterian Church, Oklahoma City, and Matt Meinke and Sue MacHugh led me through the building, appraising a few caches of records along the way. Clockwise from top left: First Presbyterian Church (Oklahoma City) portraits of pastors, exterior, Junior Brotherhood panoramic photo, and records flagged for shipping to Philadelphia, June 2017. Early in the morning of June 4, Tim Leonard, Oklahoma City jurist and brother of PHS Board member Bill Leonard, kindly picked me up for breakfast before worship at Westminster Presbyterian Church. Tim is a huge booster of the city, and a sports fan, and touring downtown's new construction and the city's leafy inner suburban neighborhoods was an inevitability and a treat. I was on for a minute for mission at Westminster, and Tim and his wife Nancy graciously paved the way for me. After worship, I spoke to a group of twenty congregants about PHS's work. That afternoon, I was on the turnpike to Tulsa. The South Tower at First Presbyterian Church (Tulsa, Okla.), June 2017. First, Tulsa, like virtually every Presbyterian congregations in the state, predates Oklahoma statehood. Its first incarnation was as a storefront Sunday school, nestled among saloons. The 1905 opening of the Glenn Pool oil field transformed the city and the congregation. Under the long pastorate of C. W. Kerr, the congregation built two buildings, including the present 1925 edifice, and grew to become one of the largest in the denomination. During the white mob violence of 1921, the church served as a sanctuary for black families. In 1928, the church hosted the General Assembly. Accordingly, the congregation has become something like a parallel archives of the city of Tulsa. 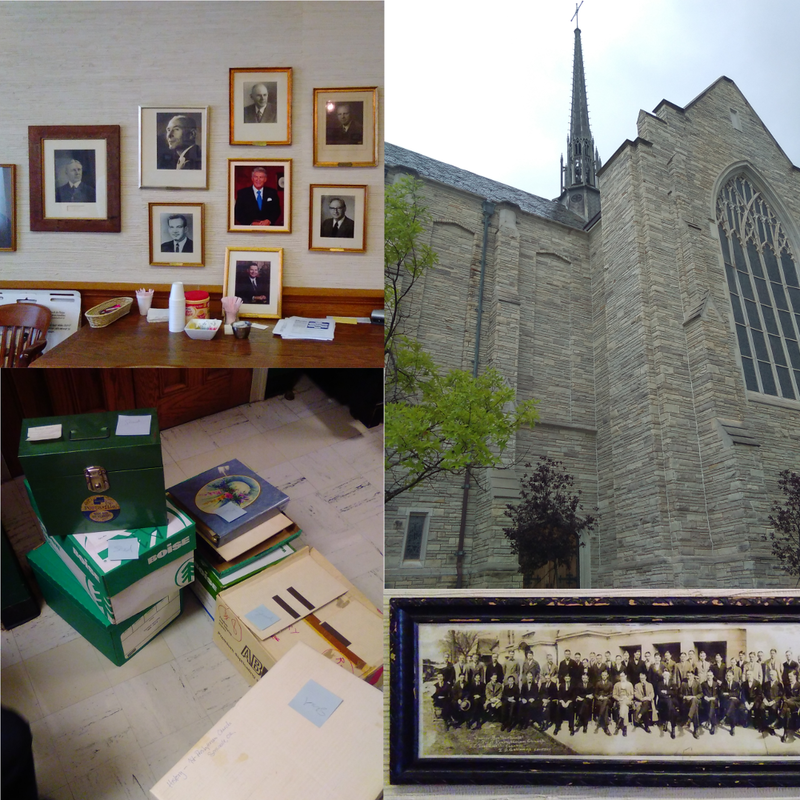 It has a collection of some 160 to 180 cubic feet of archival material, from the 1855 minutes of the Presbyterian mission to the Creek Nation, to some 3,500 CDs of recorded worship services. With the kind welcome of Vicki Wilcoxen, church archivist, Joan Hoar, chair of the archives committee, and Gary Mathews, clerk of session, I was able to spend some time with First Tulsa's collections. The seven folks in the room had a variety of questions matching the dizzying scope of the collections, and we spoke practically non-stop from 9 AM to 2 PM. First Tulsa's open reel tapes; these are shelved two-deep, June 2017. We talked about archival appraisal, sampling collections for preservation, privacy, and confidentiality issues surrounding collections, and we encountered a motion picture exhibiting vinegar syndrome. This was practically a year of archives education in one half-day outburst. Vicky Wilcoxen speaking about her work with the collections, June 2017. Vicky and Gary toured me around the main church building, including the vault where the church's earliest minutes are housed, along with a 1611 King James Bible, with the famous printing error "hee" in Ruth 3:15. Gary Mathews with minutes of First Tulsa, June 2017. I learned an immense amount about Oklahoma's peoples and history, enough to guarantee that I would regret not making time for visits to Dwight Mission, or to congregations in the southeast of the state, particularly among the Five Nations. I hope to return and make up for what I missed on this visit. You may have already read about PHS staff's travel to Big Tent in St. Louis in July, and now you've been briefed on our Oklahoma journey. Stay tuned for future travelogues on Portland, Oregon; Rochester, New York; and Lake Tahoe.